The Old Town Snow White Grill is a quaint old-fashioned diner, best known for the original mini-burger. 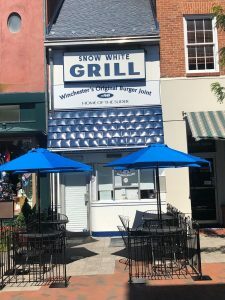 Opened in 1948, the grill opened as a family chain, and Winchester is the last standing location still in operation today by the Dilisio Family. Hours of Operation: Wednesday 11:00am - 5:00pm; Thursday 11:00am - 6:00pm; Friday & Saturday 11:00am - 8:00pm; Sunday 12:00pm - 4:00pm; Monday & Tuesday CLOSED.